What has 707hp, four-doors, and a mean attitude? If you answered “Dodge Charger Hellcat,” then give yourself a pat on the back. Better yet, check out this behind-the-scenes video of the grand-prize in the 2016 Hellcat Dream Giveaway. If you’re like us, we remember muscle cars having 300-400 horsepower, and on rare occasions like the 1965 Corvette Sting Ray L78, 425 hp. But times have changed, and now muscle cars routinely have 500+ horsepower. So to have the chance to put a professional driver behind the wheel of this 7-0-7 Hellcat on a closed track and watch him glue the go-pedal to the sheet metal was an offer we couldn’t refuse. Now here’s an offer you can’t refuse—75% bonus tickets on the 2016 Hellcat Dream Giveaway. You only have until February 28, 2017, to enter, or your opportunity to enter to win this 2016 Dodge Charger Hellcat will be gone forever. Since its inception in 2007, Dream Giveaway has become famous for pairing up a classic muscle car with its modern equivalent … and giving both away to one lucky winner. Making today’s muscle machines look like direct descendants of the old-school street rippers you fondly remember from back in the day is not always as simple as it seems. 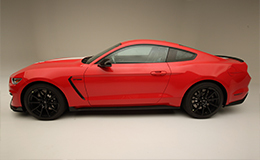 Take the 2016 Mustang Dream Giveaway for example. No doubt Ford retained the model-name GT350 because it holds a special place in the hearts of Carroll Shelby’s loyal fans. But does the new high-performance Shelby share significant DNA with the iconic first-gen Shelbys from 1965-’67? That’s where Dream Giveaway Garage comes in. If you look closely at the photo of the 2016 Shelby GT350 as it was delivered new to us from Ford, you’ll notice that Dearborn’s designers didn’t decree the cool throwback features that made the 1967 Shelby an iconic street machine. 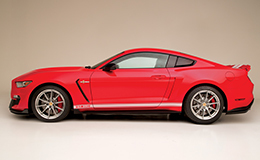 In fact, Ford left heritage styling cues entirely off of the new Shelby. With the grand-prize 1967 Shelby G.T. 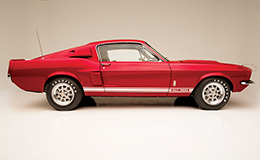 350 as a perfect styling example, Dream Giveaway Garage set out to super-style the understated new Shelby. The first thing we discovered was that the 1967 Shelby Cobra badges fit perfectly on the 2016 Shelby. Then it was simply a matter of re-creating styling cue after styling cue until the 2016 Shelby looked like it came out of Carroll Shelby’s personal collection in 1967. Now it’s contest time. Can you identify all 15 styling changes we made to the 2016 Shelby to make it look like a fast-forward version of the 1967 Shelby? Send your answers to editor@dreamgiveaway.com by January 20, 2016. We’ll pick one random winner from all responses that are received and he or she will receive a $25 gift certificate to the Ford Merchandise Store. The 2016 Mustang Dream Giveaway ends on February 28, 2017. Product Spotlight: Kelsey Tires, Inc. The next time you see period-correct Goodyear bias-ply or radial tires on a Dream Giveaway grand prize—such as the historic 1967 Shelby in the 2016 Mustang Dream Giveaway or the pedal-to-the-metal Bandit Trans Am in the brand new 2017 Bandit Dream Giveaway starring Burt Reynolds—take our word for it. Those tires are there completely on purpose. Authenticity is paramount! Remember your youthful desires for names such as Speedway Blue Streak, Wide Tread GT, Polyglas GT, Polysteel, Gatorback and many more? How does Dream Giveaway source these historic Goodyear names from the history of tires from yesterday? The answer is Kelsey Tire, Inc., of Camdenton, Missouri. They are the exclusive distributor for iconic, vintage Goodyear tires. Take a trip down the automotive memory lane of tires. You will enjoy your visit with Kelsey Tire, Inc. as much as we did. John and Janice Kelsey and their staff are always available to assist you with the correct application for your vintage pride and joy. For a limited time, mention Dream Giveaway Garage, and Kelsey Tire will discount $25 off of every tire you purchase from them. That’s $100 for a set of four tires. Congratulations to the newest members to the Dream Giveaway family of winners— Russell and Alison Rosiak from Chicago, Illinois. The Rosiaks scored big in the Big Game Dream Giveaway, which means we’ll be flying them to Houston, Texas, on February 3, 2017, a three-night stay in Rocket City, which includes two tickets to Super Bowl LI and a VIP pre-game tailgate party hosted by NFL great Joe Montana. The current Dream Giveaway in the non-automotive sector is the Home Improvement Dream Giveaway, which will award a $10,000 The Home Depot gift card to one lucky winner. Since 2013 Disabled American Veterans (DAV) has been a grant recipient for Dream Giveaway promotions, helping it fulfill its mission to empower veterans to lead high-quality lives with respect and dignity. The non-profit DAV remains a strong and influential veterans’ advocate, working tirelessly to safeguard the full range of benefits veterans have earned through their service to our country. DAV’s employment program, which connects transitioning active duty, guard and reserve members, veterans and their spouses with qualified employers, resulted in job offers for nearly 8,000 veterans. DAV helped veterans secure more than $4 billion in earned benefits. DAV helped change the lives of more than 1 million veterans. Visit www.dreamgiveaway.com today and make a donation to enter to win some amazing prize packages and help DAV continue to provide a lifetime of support for veterans of all generations and their families. To learn more about DAV, visit dav.org. Christopher R. Phillip is the former senior associate editor of Vette magazine, the editor of High Performance Pontiac magazine and his feature stories and photography have appeared in well known, national automotive-enthusaist magazines, including Hot Rod, Car Craft, Mustang Driver and others. In addition he is a top-rated celebrity interviewer with published articles on Burt Reynolds, Jack LaLanne, Frank Zappa, Carlos Santana, and many others.